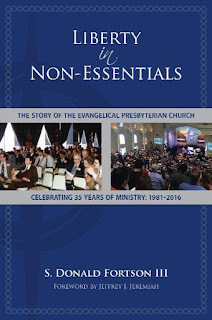 Last night as I cared for my youngest who is sick I finished reading Donald Fortson's "Liberty in Non-Essentials," a history of the Evangelical Presbyterian Church, my denomination and the denomination of the congregation I serve since 2013. 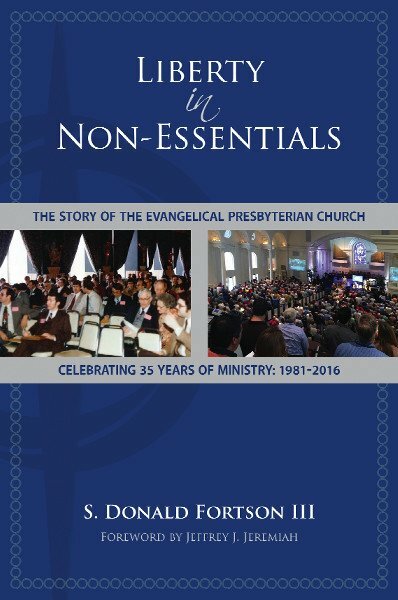 I knew much of the theology of the EPC, but understanding how this denomination arrived at the present moment since its inception in 1980 has really helped me to understand the ethos of our denomination. As we explored the EPC I was initially attracted to its motto, "In Essentials...Unity. In Non-Essentials...Liberty. In All Things...Charity." This quote is usually attributed to Augustine, who never seemed to say this exactly, but in a letter to Januarius he said something similar in the second paragraph (though he was surely referencing practice and not doctrine). The actual quote seems to come from the Reformation era, but who said it first seems to be a matter of debate, but most agree that it was made popular by Rupertus Meldenius, a German Lutheran theologian. Throughout its life, the EPC has struggled to maintain the bond of unity in the midst of disagreements. Matters of spiritual gifts, women's ordination and the right place of the Westminster Confession in the life of the denomination have threatened to splinter our little Presbyterian tribe. Yet, over and again, what bonds us together, absolute and complete trust in Christ Jesus as Lord and Savior, has allowed for creative ways to practice liberty (a least that's Fortson's argument, but also my experience over these last four years). Lest we think this is a modern problem brought on by the Enlightenment's (and thus Modernity's) distrust of authority and its twin, the hermeneutic of suspicion, we find that even in the little congregation in Philippi in the early days of the church there was disagreement and threatened disunity. We do not have a full picture of what caused these women, Euodia and Syntche, to be in conflict, but we do have the Apostle's full prescription in Philippians 2:2, "complete my joy by being of the same mind, having the same love, being in full accord and of one mind." I commented on this text some time back, but let me summarize that the Apostle encouraged the Philippians to unite around Christ Jesus, their humble and exalted Lord. The Apostle further asked the rest of the Church to come together to assist these women in finding once more the mind of Christ and coming to unity and agreement in Him. As a Church it should be this same aim that we seek in the midst of conflict with each other. In essence, there are two approaches to church unity. The first is to only allow in those who are in complete and total agreement with yourself. Such unity requires a constant policing of the borders of faith and practice, making sure to exclude any who would stray from the flock. This is the negative form of fundamentalism that usually transgresses into a petty legalism and only apparent unity. The disunity and conflict are pushed out of the particular congregation or denomination, but it is not really resolved. One of the reasons we left our former denomination is that we met a kind of theologically liberal version of this fundamentalism and we wanted nothing more to do with it. The Apostle's call to the Philippians in our passage today is nonsense in this approach to church unity and, over time, this kind of unity fails to produce vibrant faith. The approach to unity is to concentrate on the center. The Apostle Paul claimed in Colossians 1:17, "And he is before all things, and in him all things hold together." Jesus is the reason for all things and the reason all things hold together. In short, Christ must be at the center. Real unity begins with putting Christ at the center of one's life and at the life of the local church, not to mention at the denomination level. There are markers of belonging and not belonging to Christ that cannot be ignored, but unity begins and ends with Christ at the center. Unity grows when we recognize we share the Church as our names are in the Book of Life and that moving to the center, where Christ is, is a team sport. As a Church we are united in Christ. There will be areas of disagreement, but not in the matter of Christ, our center. Let this serve as an encouragement to you to make peace and build the unity of the Church in Christ Jesus our Lord. "Euodia and Syntyche" is one of my favorite stories, because of the meaning of their names. "Euodia" is Greek for "OCD" and "Syntyche" means "impulsive." That has helped me relax about a lot of relationship conflicts where we had opposite personalities. Blessings.